During the 8 days of Hanukkah, we can make the food healthier and still enjoy the holiday foods. Lets honor our bodies and the environment this Hanukkah by including more whole plant-based foods on our tables. Let’s eat more fruit, vegetables, tubers, legumes, and whole grains this Chanukah/Hanukah. Here are 7 simple food tips for our healthier Hanukkah. The benefits of serving cut apples as an appetizer are multi-layered. First, you incorporate a part of your daily serving of fruit into your meal for a complete diet. Second, next to vegetables, fruits are a high density, low calorie food. Although apple’s take up a lot of physical space in your stomach, they do not contain a lot of calories. On average one medium-sized apple has about 95 calories. What does this mean? If you eat an apple for your appetizer you are less likely to overeat during the main course of your meal. If you choose one of these healthy tips, let it be this one. Please, bake your latkes instead of frying. Frying foods introduces partially hydrogenated oils into your diet and it has a number of negative health associates. Fried oils have to be heated to a high temperature, this causes oxidation of the oils and starches produce Advanced Glycation End products. This is a fancy term for your food becomes carcinogenic. Avoid over consuming fried foods whenever you have the choice. If you are looking for a baked latke recipe, you can find it right here. Adding a salad to your table provides a number of the same benefits as the apple appetizer, high density foods that take up space but do not have high caloric values associated with them. The other benefit, fiber, we all need more fiber during heavy holiday meals to help everything digest smoothly. Over consuming fried foods is bad enough for your health it’s worth mentioning twice. Bake your typically fried foods for a significantly healthier Hanukkah season. Your stomach and your family will thank you. 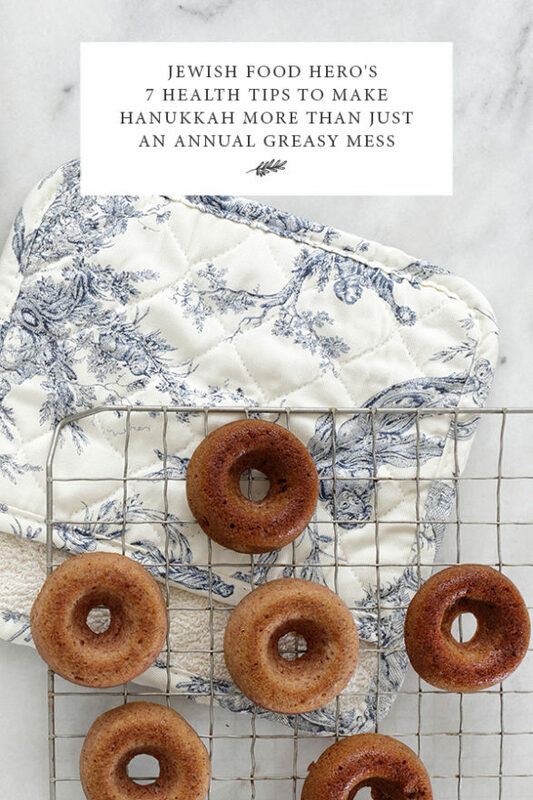 If you are looking for a baked sufganiyot recipe, there is one in this Jewish cookbook. When you choose to make your own foods at home, you have so much more control of the ingredients you put into the recipe. Making your own applesauce allows you to pick the quality of the apples and your other ingredients. In the long run, this is usually a more economical option too. Not only are you eating healthier, you’re spending your money wisely too. If you are looking for a simple applesauce recipe, you can find it right here. Tofu is a wonderful high protein, low fat food. Use it as a replacement for condiments in your meals where animal-based products may normally be used. This will increase the overall protein value of your meal while eliminating the overconsumption of animal products. There is a tofu sour cream recipe in this Jewish cookbook. Serve water based drinks like fruit infused waters, soda water with natural syrups rather than soda and boxed juices. Next to removing fried foods from your holiday table this season, getting rid of sugar-heavy beverages is the easiest change to make to have a healthier Hanukkah. There are an overwhelming amount of benefits to reducing your overall sugar consumption. From reduced health risks to better brain power to clearer skin, there’s a reason for everyone to lower their sugar consumption for themselves and their loved ones. Your turn: Share your favorite healthy tip for Hanukkah in the comments below. Next What’s On Your Hanukkah Playlist, Shifra C. Penkower?